Toto, the little dog from The Wizard of Oz, is a perfect example of the Cairn Terrier Temperament: lively, intelligent and loyal. This charming little dog originated in Scotland, where hunters used him to kill vermin from around the cairns, or piles of rocks. He has a strong chase instinct, which translates to a strong prey drive. He is simply unable to resist the opportunity to run after anything that looks like prey. You must be extremely cautious about letting your Cairn off-leash because he will pursue anything that moves – and he won't come back when you call him either. 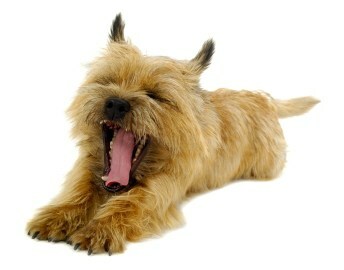 Does the Fearless Cairn Terrier Temperament Suit Your Family? If you have older children, they will greatly enjoy the company of a Cairn Terrier. He is great fun and will happily accompany your family on all your outdoor activities. He is not a particularly cuddly dog, so don’t expect him to willingly snuggle up on your lap. Instead he prefers to be on the move with you, rather than sitting still. This is one dog temperament that remains playful and active until he is in his golden years. As with all Terriers, the Cairn can be stubborn and independent – he wants to be the boss. This means that you need to show him that you are in charge. If you let him think he thinks he rules your home, then he will take the opportunity to do so. Early and regular training throughout his life is the key to owning a well-behaved Cairn Terrier. Cairn Terriers are barkers, often barking at even the slightest sound. This is typical of all Terrier dog temperaments. While it’s good for him to alert you when a stranger is around, it can make him – and, by proxy, you – unpopular with your neighbors. You need to train him to stop barking when you say so. You also need to confine him when you aren't around to keep an eye on him. The Cairn Terrier and Other Animals. The Cairn Terrier can be aggressive with other animals. His bossy nature may lead him into scuffles with other dogs, and he is likely to chase and possibly even hurt cats. You can, however, teach him to live harmoniously with pets of other species if you socialize them from a young age. I have also found that the Cairn Terrier temperament is calmer if you give him toys to hunt. Throw a squeaky toy for him, then watch him pounce upon and shake it. This gives him the opportunity to express his innate behaviors. However, you can never trust a predatory dog temperament around potential prey, so don't leave your Cairn unsupervised around small animals. Your Dog's Temperament and Your Garden! The Cairn has large feet and strong claws, which serves him well for the purpose of digging out rats and mice. This doesn't, however, bode well for him when he digs holes in your backyard or destroys your carefully laid-out garden. You won't be able to reliably train him out of digging, as it is ingrained in him. To help your flowers survive his wrath, try using a decorative fence to keep your Cairn away from them. Alternatively, keep your dog in the backyard and plant your nice garden in front of your house. Another good idea is to give your dog his own area to dig in, whether it be a corner of your yard or a child's sandpit. Bury his squeaky toys in the sand, and he will enjoy digging them up and chewing on them. This busy little dog needs activity, so it's important that he gets plenty of exercises. With active dog temperaments like that of the Cairn Terrier, you'll find that you will be more active too, which is good for the both of you. If he doesn't get the exercise he needs, he will become bored and will bark more, dig more and generally be more of a problem. 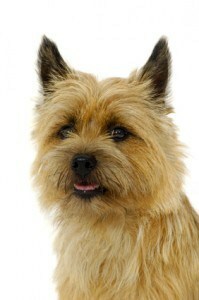 The Cairn Terrier is the ideal dog for active families who have time to train and socialize their dog as he grows up. He is sturdy, intelligent and always keen to go on adventures with you. If you are looking to add a playful, intelligent and energetic four-legged pet to your family, then you can't go wrong with the Cairn Terrier. Cairn Terriers are very smart dogs, but they adore challenging you – much to your own chagrin. They are fast learners, but you have to watch out for his vulnerability to his own desires to dig or chase. Socialize him early so you can train him out of any bad habits as soon as possible. If you find you are not making headway with him, enroll him in obedience classes ASAP. The earlier he can learn good behavior, the longer he has to practice it, and by the time he’s an adult, he will have mastered it. Cairn Terriers are fairly low maintenance when it comes to grooming. Brush and comb him weekly, and hand-strip him from time to time to maintain the texture of his coat. While you may have heard some say that Cairn Terriers are hypoallergenic, this is actually not true – no dog is. The only way to know for sure if you’re allergic is to spend a significant amount of time with the dog. As for the colors a Cairn Terrier’s coat comes in, he can be black, brindle, wheaten, red, grey, or cream. If you’re the type who melts over the adorable combinations a mixed breed can come in, then you’ll want to know the kinds of Cairn Terrier mixes out there. The Cairn Terrier's life expectancy is between 12 and 15 years. As for his size, a normal weight for a Cairn Terrier is between 13 and 18 lbs., no matter the gender. His height is between 9 and 13 inches. Interested in adding a Cairn Terrier puppy to your family? Congratulations! You can find a Cairn Terrier for sale either through a Cairn Terrier breeder or from a local rescue or adoption agency. The average Cairn Terrier price is between $700 and $1,000. This isn’t terrible as far as prices of puppies go. Of course, the dog will be more on the expensive side if he has a particularly pure bloodline. And sometimes it all boils down to what the breeder decides to charge. If you would like to adopt a CairnTerrier, visit the website for the Cairn Terrier Clubof America. The group suggests bothbreeders and rescue groups that can help match you with an adoptable CairnTerrier that will be a good fit for your home and family. Most of the Cairn Terriers whoare up for adoption are adult dogs who ended up at “the pound” through no faultof their own. For example, many dogs end up in a shelter when their owners canno longer afford to feed or take care of them. There are numerous benefits toadopting an adult rescue dog. For one thing, they usually have some sort oftraining, and because they are older, they are not as destructive or rowdy as arepuppies. Cairn Terriers may not be commonin shelters where you live, but it is still a good idea to visit your nearbyshelters and put an application on file. That way, if one becomes available,you’re one of the first the shelter will consider! The adoption fee varies, depending on the rescue organization. For instance, municipal shelters usually ask for a donation averaging between $75 and $150. Private rescue groups, however, may charge a higher fee, with some shelters asking for a donation of $400 per dog. There are often discounts if you’re okay with adopting a senior dog. Cairn Terriers adopted through rescue groups and animal shelters are always spayed/neutered and examined before you adopt them. This is to ensure that you are getting the highest quality dog the shelter could possibly promise. Some people decide instead to pursue a Cairn Terrier breeder for the purpose of purchasing a Cairn Terrier for sale. If you decide to go this route, your Cairn Terrier puppy price will likely be between $700 and $1000, depending on both the breeder and the breeding. If you decide to explore Cairn Terrier breeders, you must take extra caution to find an ethical breeder. Avoid puppy mills and pet stores at all costs! We have a serious problem with the pet overpopulation in this country. Animal shelters are overflowing with animals and are constantly euthanizing some of them due to the lack of being able to home them all. Irresponsible breeders and puppy mills produce puppies to make money. They have little to no regard for their puppies’ health and/or behavior. On the other hand, responsible breeders pay close attention to creating cheerful, healthy puppies. They do not overbreed, and they make sure each one of their pups gets a good “forever” home. Good breeders require buyers to sign a spay/neuter contract in the hopes that their puppies will never be another statistic in the overpopulation problem. It can be a lot of work to find an ethical breeder, but it is worth it in the end. Conclusion: Why the Cairn Terrier? 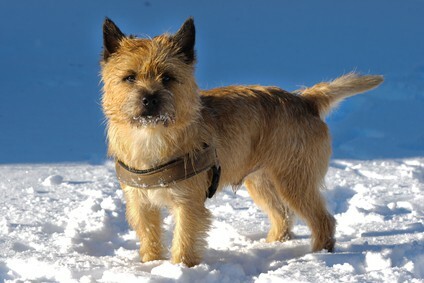 The hardy Cairn Terrier temperament can be challenging at times, fun at others. He will keep you on your toes, that’s for sure! He has an incredibly strong prey drive and desire to chase, so keep him away from any animals that he may consider to be prey. In other words, do not get a Cairn Terrier if you have cats, birds, fish, or any other animal he might feel tempted to hunt. The Cairn also loves to dig. So, if you have a prize-winning garden or flowerbed, you’re going to want to keep your garden on the opposite side of the house from where the dog goes. Other than that, he’s a great dog who loves kids and his family and enjoys accompanying them wherever they go.